The Ashley Maria Blog: Gift Guide | What to Get Your Bosses? 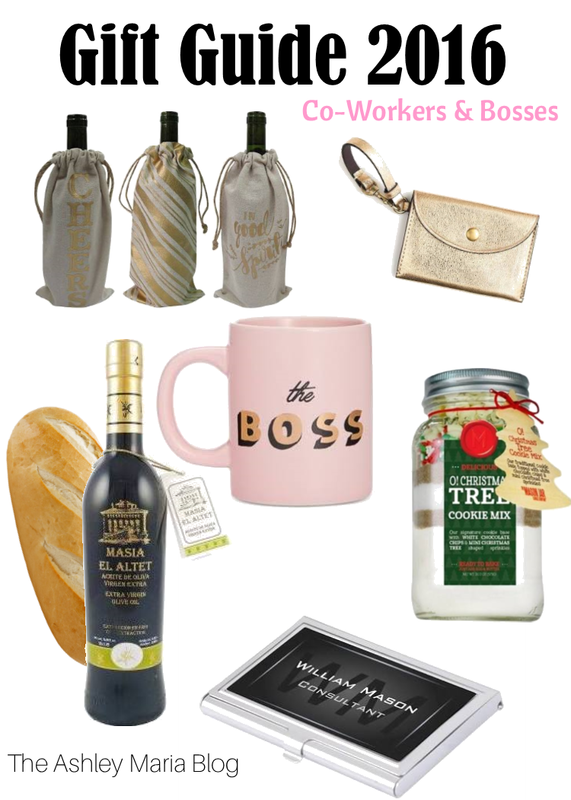 Gift Guide | What to Get Your Bosses? Every year I struggle to find gifts for my co-workers and bosses. I don't want to spend too much and let them think they pay me too much (do you think they would actually think that??) but don't want to look cheap. Here is a list I put together that may work for your co-workers and bosses! Some things you can't go wrong with is a bottle of wine, craft beer or alcohol. Even if they don't drink, they can use it to entertain during the holiday's. Put it in a cute bag and it's that easy! The ladies I work with in my office don't like to carry a purse, because they don't want to put it on the floor or take up space in a drawer. Therefore they carry just a little coin or change purse with just the essentials. I believe that any place you work, whether it be in an office, construction site, or retail you can never go wrong with food or coffee! A cute coffee mug or fresh baked goods are always a win!